In general, academic but not community endoscopists have demonstrated adequate endoscopic differentiation accuracy to make the ’resect and discard’ paradigm for diminutive colorectal polyps workable. Computer analysis of video could potentially eliminate the obstacle of interobserver variability in endoscopic polyp interpretation and enable widespread acceptance of ’resect and discard’. We developed an artificial intelligence (AI) model for real-time assessment of endoscopic video images of colorectal polyps. A deep convolutional neural network model was used. Only narrow band imaging video frames were used, split equally between relevant multiclasses. Unaltered videos from routine exams not specifically designed or adapted for AI classification were used to train and validate the model. The model was tested on a separate series of 125 videos of consecutively encountered diminutive polyps that were proven to be adenomas or hyperplastic polyps. The AI model works with a confidence mechanism and did not generate sufficient confidence to predict the histology of 19 polyps in the test set, representing 15% of the polyps. For the remaining 106 diminutive polyps, the accuracy of the model was 94% (95% CI 86% to 97%), the sensitivity for identification of adenomas was 98% (95% CI 92% to 100%), specificity was 83% (95% CI 67% to 93%), negative predictive value 97% and positive predictive value 90%. An AI model trained on endoscopic video can differentiate diminutive adenomas from hyperplastic polyps with high accuracy. Additional study of this programme in a live patient clinical trial setting to address resect and discard is planned. Accurate Classification of Diminutive Colorectal Polyps Using Computer-aided Analysis. Narrow-band imaging (NBI) is an image-enhanced form of endoscopy used to observed microstructures and capillaries of the mucosal epithelium that allows for real-time prediction of histologic features of colorectal polyps. However, NBI expertise is required to differentiate hyperplastic from neoplastic polyps with high levels of accuracy. We developed and tested a system of computer-aided diagnosis with a deep neural network (DNN-CAD) to analyze narrow-band images of diminutive colorectal polyps. We collected 1476 images of neoplastic polyps and 681 images of hyperplastic polyps, obtained from the picture archiving and communications system database in a tertiary hospital in Taiwan. Histologic findings from the polyps were also collected and used as the reference standard. The images and data were used to train the DNN. A test set of images (96 hyperplastic and 188 neoplastic polyps, smaller than 5 mm), obtained from patients who underwent colonoscopies from March 2017 through August 2017, was then used to test the diagnostic ability of the DNN-CAD vs endoscopists (2 expert and 4 novice), who were asked to classify the images of the test set as neoplastic or hyperplastic. Their classifications were compared with findings from histologic analysis. The primary outcome measures were diagnostic accuracy, sensitivity, specificity, positive predictive value (PPV), negative predictive value (NPV), and diagnostic time. The accuracy, sensitivity, specificity, PPV, NPV, and diagnostic time were compared among DNN-CAD, the novice endoscopists, and the expert endoscopists. The study was designed to detect a difference of 10% in accuracy by a 2-sided McNemar test. : In the test set, the DNN-CAD identified neoplastic or hyperplastic polyps with 96.3% sensitivity, 78.1% specificity, a PPV of 89.6%, and a NPV of 91.5%. Fewer than half of the novice endoscopists classified polyps with a NPV of 90% (their NPVs ranged from 73.9% to 84.0%). DNN-CAD classified polyps as neoplastic or hyperplastic in 0.45±0.07 sec—shorter than the time required by experts (1.54±1.30 sec) and nonexperts (1.77±1.37 sec) (both P<.001). DNN-CAD classified polyps with perfect intra-observer agreement (kappa score of 1). There was a low level of intra-observer and inter-observer agreement in classification among endoscopists. We developed a system called DNN-CAD to identify neoplastic or hyperplastic colorectal polyps less than 5 mm; it classified polyps with a PPV of 89.6%, and a NPV of 91.5%, and in a shorter time than endoscopists. This deep-learning model has potential for not only endoscopic image recognition but for other forms of medical image analysis, including sonography, computed tomography, and magnetic resonance images. Die endoskopische Differentialdiagnose von Kolonpolypen wurde in der letzten Zeit im Rahmen der sog. DISCARD Diskussion vielfach besprochen. DISCARD bedeutet, kleine Polypen (< 5 mm) nach der endoskopischen Abtragung nicht zur Histologie einzusenden, sondern die Nachsorgeintervalle nach dem endoskopischen Aspekt (Adenom oder hyperplastisch) zu richten1; manche Autoren nennen dies auch Anführungszeichen endoskopische Histologie“. Entsprechende Guidelines wurden daraufhin produziert, die für die Genauigkeit dieser Differenzialdiagnose festlegen und weiterhin auch bestimmen, mit welcher Konfidenz dieser Differenzialdiagnose möglich war, um das Konzept in die klinische Realität umzusetzen2. Danach sind allerdings einige Studien erschienen, die gezeigt haben, dass dies in hoch motivierten akademischen Zentren mit dem starken Willen, exzellente Ergebnisse zu publizieren, funktionieren mag, aber schon deutlich weniger in der klinischen Studienpraxis in der Breite3-6; unter den letztgenannten Studien kam die größte aus Großbritannien, bei der auch die “Erfinder” von DISCARD beteiligt waren3. Diese Diskrepanz mag nicht prinzipiell gegen die endoskopische Differenzialdiagnose sprechen, lässt aber Wünsche aufkommen, dass subjektive Element aus der Bildbeurteilung zu eliminieren. Daher erscheint die Anwendung von künstlicher Intelligenz (KI) für diese Indikation durchaus logisch. 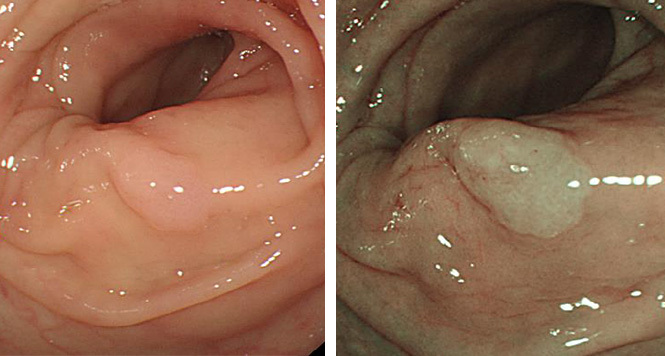 Nichtsdestotrotz muss sichergestellt werden, dass ein jegliches KI System auf der Basis validierter Bilder mit ausreichendem histologischen Goldstandard (ein oder besser zwei erfahrene gastroenterologische Pathologen) trainiert wird. Im ersten Paper von Doug Rex und Mitarbeitern7 erfolgte dies nur in begrenztem Ausmaß (Videoaufnahmen mit standardisierten Aufnahme Protokoll, Routinepathologie), die japanische Studie8 hatte eine bessere histologische Beurteilung (im Konsensus), aber eine artifiziell optimierte Bildbeurteilung (ausgewählte Bilder bester Qualität). Gerade letzteres wird wahrscheinlich nicht den Alltag mit bewegten Bildern widerspiegeln. Beide Arbeiten hatten allerdings eine adäquate Methodologie mit einem Trainings – und Validierungsset an Bildern/Videos. In beiden Arbeiten lag die Treffsicherheit um die 80-95%, allerdings mit Unterschieden zwischen Sensitivität (98% USA 96% Japan) and Spezifität (83% USA, 78% Japan), was in etwa so gut ist als die Beurteilung durch Experten in früheren wie auch in diesen Papers2. diese Ergebnisse sind angesichts der frühen Entwicklungsphase und des Potenzials von deep learning (das hier benutzte KI-System), sich selbst vor zu entwickeln, bereits beachtlich. Die Autoren erwähnen diese Limitationen wie auch das zukünftige Potenzial in den Diskussionen zu den beiden Papers. Generell gibt es darüber hinaus aber noch zahlreiche hoch interessante Perspektiven für KI in der Endoskopie. Die Differenzialdiagnose von kleinen Polypen ist daher nur ein Beginn, vorstellbar ist die Beurteilung anderer Strukturen im Hinblick auf ihre Gewebedifferenzierung (Barrett, Schleimhaut-abnormalitäten, CED etc), was sicher noch mehr komplex ist. Mit dem selben Hintergrund wäre die nächste Stufe allerdings nach der Gewebedifferenzierung auch die Entdeckung von Läsionen, zum Beispiel die Polypen detection. Eine automatische Adenom Detektionsrate per Computer könnte den Endoskopiker deutlich entlasten und würde auch besser das Potenzial von Superweitwinkel-koloskopen zur Geltung bringen. Ignjatovic A, East JE, Suzuki N, et al. Optical diagnosis of small colorectal polyps at routine colonoscopy (Detect InSpect ChAracterise Resect and Discard; DISCARD trial): a prospective cohort study. Lancet Oncol 2009;10:1171-8. Abu Dayyeh BK, Thosani N, Konda V, et al. ASGE Technology Committee systematic review and meta-analysis assessing the ASGE PIVI thresholds for adopting real-time endoscopic assessment of the histology of diminutive colorectal polyps. Gastrointest Endosc 2015;81:502.e1-502.e16. Rees CJ, Rajasekhar PT, Wilson A, et al. Narrow band imaging optical diagnosis of small colorectal polyps in routine clinical practice: the Detect Inspect Characterise Resect and Discard 2 (DISCARD 2) study. Gut 2017;66:887-895. Vu HT, Sayuk GS, Hollander TG, et al. Resect and discard approach to colon polyps: real-world applicability among academic and community gastroenterologists. Dig Dis Sci 2015;60:502-8. Schachschal G, Mayr M, Treszl A, et al. 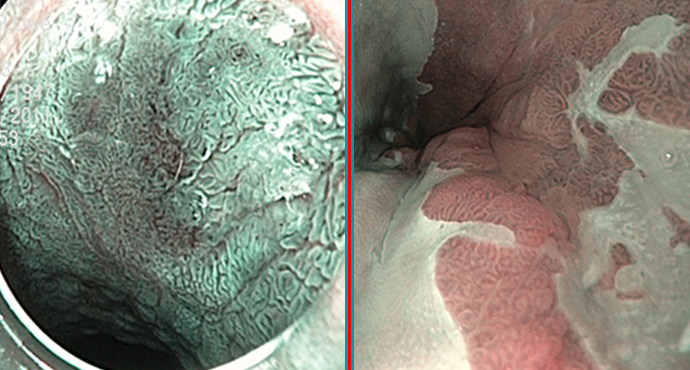 Endoscopic versus histological characterisation of polyps during screening colonoscopy. Gut 2014;63:458-65. Ladabaum U, Fioritto A, Mitani A, et al. Real-time optical biopsy of colon polyps with narrow band imaging in community practice does not yet meet key thresholds for clinical decisions. Gastroenterology 2013;144:81-91. Byrne MF, Chapados N, Soudan F, et al. Real-time differentiation of adenomatous and hyperplastic diminutive colorectal polyps during analysis of unaltered videos of standard colonoscopy using a deep learning model. Gut 2017. Chen PJ, Lin MC, Lai MJ, et al. Accurate Classification of Diminutive Colorectal Polyps Using Computer-aided Analysis. Gastroenterology 2017.